Today October 26, my parents anniversary. I’m headed to my husband’s parents home to help care for his Dad because he is not doing well. I began my journey with a stop to fill up the gas tank and realized today’s date. I decided to make a quick trip to the local store to pick up some flowers to take to my parent’s graveside to honor them on this special day- it’s only a few minutes out of the way…alas, they have both graduated to Heaven. Today would’ve been their 60th wedding anniversary! I know, it’s more form me than for them, but it just felt like the right thing to do. As I thought about it I realized it’s also another kind of a coming-of-age season; it will be 21 years since my mom passed and graduated to heaven this November 7th. She was followed by my dad seven years later. Twenty-one years! How fast it’s gone. Sometimes it feels like an eternity! Every day I realize more and more how grateful I am for the lessons they taught me and for the things that I learned through the experiences in my family of origin. Not just during the good times; in fact, in hindsight, some of the most valuable ones came in the difficult times. So many of my relatives have already gone before me; only cousins left and of course my wonderful adult children, children in love(spouses), and eight amazing grandchildren. There has been a great deal of loss in my life, BUT there have been many glorious blessings! One of the things I have learned is God is good even in the hard times when we are tempted to doubt His goodness. God knows our every struggle and His timing is perfect even when we can’t understand it or believe that it’s true! Sometimes that’s a hard lesson to learn when everything seems to be caving in all around. So why is this perhaps the second coming of age? We think when we turn 21 or 18 for some of us that we are all grown up, but that’s not necessarily true. We become adults, and we become more responsible for things. We do what today is termed ‘adulting.’ Honestly though, many of us still value the wisdom of our elders and seek out advice on some of the tougher things in life, and sometimes we just want to share the joys of life with them. We may not depend on them anymore, but it’s still nice to know there is someone to turn to at times of great joy, sorrow or trouble; until they aren’t there. Trust me; there’s been more than a few times early on that I’ve picked up the phone ready to dial and realized…I can’t call you. I can’t share that joyful news or ask that question. Honestly, I remember feeling like an orphan. That truly sounds kind of silly or ridiculous; I was 34 and 41 respectively when they went home. For a season, I felt like an adult orphan. It was comforting to find later out that I wasn’t the only one who felt this. I usually don’t share things this personal. However, death and loss are things that hit everyone at one time or another. We may feel in invincible and think those we love are as well, but the truth is life can be fragile; it flies by in the blink of an eye. We will all experience loss, and we must deal with it at our own pace and in our way. It’s hard, and it is painful; excruciating at times, to be honest. Those who have elder parents still living as my husband does know the only thing as hard as losing them in their prime is watching them grow weaker and lose the ability to do the things that once brought them great joy. Cherish the moments, learn to find joy and humor in the good times and if at all possible in the difficult ones also; it helps take some of the bite out of the hard stuff! Last Friday, my father-in-love got quite ill and on top of that had a fall and ended up in the E.R. By Saturday evening he was improving except for pain from the fall. After seeking x-rays and additional care to ensure no missed broken bones, he was given something for pain on Tuesday. The adverse effects took a toll on him and knocked him out for about 36 hours. Thankfully, today, his color is back, and he is eating and drinking well but is still weak and sleeping a lot. He is blessed to be 87, but it takes longer to bounce back, and we are hoping he returns to his self. Sometimes in our life, the important just must take precedence over those things always declaring themselves urgent. In those times we must slow down and slow the crazy race that has become our life and remember what is truly important. It has been said to seize the day, but sometimes we just need to capture the moment. Linger a minute, find a moment to make a quick call; share a hug and say I love you. When we do, we leave our self less open to doubt and living with regrets later in life. Often remembering the little things like this help make it more bearable when loss and grief come your way. 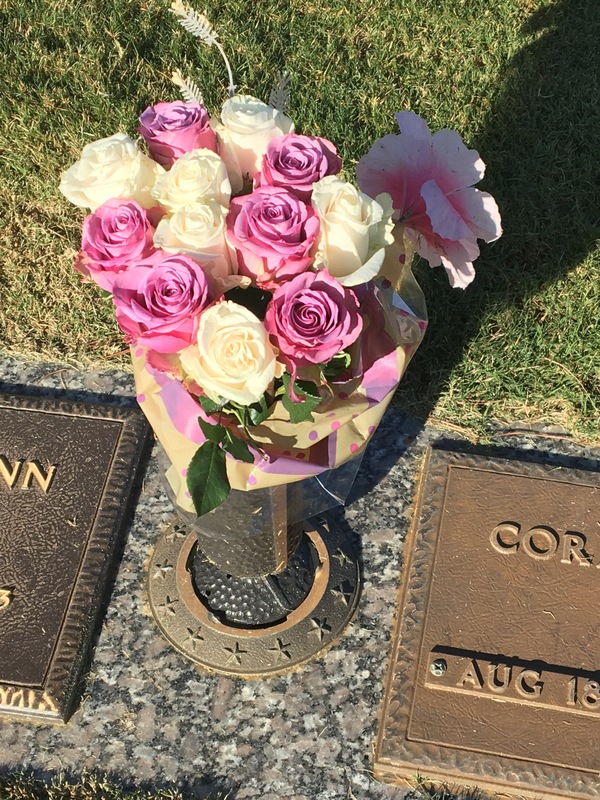 It may seem a bit silly to celebrate my parents 60th anniversary by taking a bouquet to the place where their bodies rest; but for me, it brought great joy in remembering them today. I learned a lot about life and marriage from them, both what to do and what not to do. They instilled many good traits and habits in me and maybe a few patterns that needed to be broken. I still miss them and many times merely long to talk with them, share a home-cooked meal, or just sit in front of the fire and be together. I’m deeply grateful for their influence and that we did these things often. I am even more thankful for the faith they instilled in me, and that the Lord has grown in me. It gives me a blessed hope and the ability to say with assurance; we will be reunited once again and share in our Heavenly Father’s glory for eternity. I hope that sharing a piece of my journey will be a comfort and blessing for those dealing with struggles and loss. Grace and Peace to you in the name of our Lord, Jesus! Seven days have passed since the historic election of 2016. One would think that by now things would be beginning to settle, yet emotions for many are still running high. From fear to elation, the sentiments range the gamut! Tears, riots, all the way to shouts of joy have been present. Never have I witnessed a political season like the one we have seen this time! For the most part, it is my personality, to keep quiet about such things; research the candidates, their records, and their character and quietly make my decision. I seldom if ever weigh in over social media but today I feel compelled to comment hoping to bring some peace and reassurance to those who are uncomfortable, fearful, worried or downright angry. Based on this scripture alone, God is NOT surprised by the outcome of this election! He is not wringing His hands with concern about what the future holds. God already knows, and there is a purpose and plan for our country and for those He has allowed to come into positions of authority. He is perfectly aware that many of us have been shaking our heads for months over the political circus and were surprised at those chosen for the final leg of this journey. Many people found it hard to choose because they had issues with both of the candidates. The good news is that comfort can be found in Scripture. The Bible is full of hope for us, we just have to search it out. One such story that comes to mind is found in the book of Esther. The King’s right-hand man plots and schemes until a directive was signed to rid the kingdom of all Jewish subjects; which by the way would include the Queen, unbeknownst to the King. Though God’s name is not mentioned once within the book; it’s obvious He is active throughout the events. Then there’s the mighty victory of Gideon whose army was whittled down from 22,000 to 300 men. These were impossible odds for success, but with God on their side, nothing was impossible! The key is for us to stir up our faith and trust God; remind our self that He is Sovereign and in control; He not only has a plan but it is a purposeful plan for a good outcome for His people. my foes and my enemies stumbled and fell. There are 365 fear not scriptures. Many scriptures can be found about hope, peace, trust, comfort, etc. When I find myself in need of encouragement, I find key words and Google to be particularly helpful (key word + scripture). May His grace and peace abound to you! It’s good to sit down to write again. Life has been quite busy and full of surprises both good and challenging. This year has been lightening fast, and it is hard to believe November is here. November is a bittersweet month around our house. We love Thanksgiving and all the traditions, celebrations, and family times. At the same time, it is a time we remember some dear family members who graduated to their heavenly home; many whose home-going was during the month of November. November is also the month my husband and I have the pleasure of celebrating our anniversary. I remember as a little tot; it was November when I attended the funeral of my Grand-daddy and my Great-grandmother. I’m not sure why the time of year stands out in my memory. Many years later, we also buried my husband’s beloved brother in November 1985; followed by my Mom and Dad in 1996 and 2003 respectively. Today it has been twenty years to date since my Mom took her heavenly voyage way to young! (Just a few years older than me) As you might imagine, I have been reminiscing a bit as the day has approached. I have remembered special times and fond memories, thinking how much she would have enjoyed her seven great-grandchildren and looked forward to the new little one soon to be born. Today also marks another special day in November; another reason to be thankful for all the Lord has done in our lives. It marks the end of a season, a labor of love that has resulted in the birth of a dream. Conceived in childhood, implanted in 2014; finally a reality today. By God’s unfathomable grace, I am able to hold tight to Him and His grace to face all that November brings into my life; both good and challenging! Every single month for that matter. Life is full of wonderful and wonder-filled moments and it is important to remember each one! It is also filled with many challenging times when we must hold on to our faith, His grace and all that is good in our lives just to take our next breath! His grace is sufficient for every situation! Be Blessed and may His grace and peace fill your days! Almost three weeks since the last blog, and what three weeks it has been! One thing right after another either for us or for those we love; sometimes both at the same time. It seems as though everyone is struggling with several things and all at once. I am not sure whether this is just a season or a sign of the times in which we live. But one thing is sure. People are struggling daily. We are surrounded by news of floods, fires, earthquakes. We are inundated with this political party declaring that if that party gets elected, we are doomed. Consequently, the other party is repeating the same doom and gloom message about the first party. Major events and happenings that were once considered newsworthy to the public have taken a back seat to celebrity gossip, the rehashing of a story from months ago that they just will not let go of, and slanderous political accusations. It is no wonder people struggle with anxiety and fear like never before; on top of dealing with the things everyday life throws our way we are bombarded with more news than anyone was ever intended to handle. Much of it bad news. The question that looms before us: What’s a person to do? How do we live in a 24 hour a day world, overloaded with information, see violence and acts of terror paraded before our eyes live on the news or our computer screens? How do protect ourselves from becoming anxious bundles of nerves just waiting for the other shoe to drop? I realize there is a flip side to the coin, and all isn’t doom and gloom. There is still a beautiful world out there, and there are excellent and kind people all around us. Beauty, grace, love, mercy are all around us, ready to be found. Many would ask where? One of the things I learned during the season my son was stationed in Iraq 2004-2005 was that it isn’t healthy for me to tune into the news. Occasionally watching was okay but for the most part, I avoided the world news and replaced it with time spent praying for those on the battlefields. Praying for their safety and provision of needs was hands down better that listening to the news and wondering and worrying about the safety of our soldiers and my son! Watching the news would have made me crazy! Romans 12:2 tells us, “And do not be conformed to this world, but be transformed by the renewing of your mind, so that you may prove what the will of God is, that which is good and acceptable and perfect.” (NASB) How do we do this? How do we renew our thinking or soothe our anxious thoughts? Just like we get rid of a bad habit by replacing it with a better habit; because just stopping the bad habit is never enough for long term success. We also need to look at our thinking the same way. What are the things we are focusing on that are causing anxiety? Fear? How can we change our thoughts, so they instill faith rather that fear and peace instead of anxiety? Back to Philippians 4, we think on whatever is true, whatever is honorable, whatever is right, whatever is pure, whatever is lovely, whatever is of good repute. Another tactic that works for me is to search out God’s promises in the area I am struggling. Here Google is my friend. I will search God’s promises for peace or scriptures on comfort. What does the Bible say about fear? There’s a whole lot of comfort and peace in the words penned by godly men throughout the centuries, and they are much more relevant today than most people think. Lastly, I have found prayer very helpful in the process of changing my thinking and dealing with the hard things in life. It doesn’t have to be a formula, just sitting having a conversation with my Heavenly Father. Telling Him what’s on my heart, what’s happening and how I feel about it; asking for wisdom and understanding and sometimes even a little tattling on someone. (Just look in the Psalms, King David did too!) I follow with a time of listening, waiting… sometimes He will bring scriptures to mind that minister to my heart; sometimes a nudge to open the Bible and just read a passage and wisdom will be revealed; other times I sense I need to wait for the answer. Later I may hear an appropriate message from a Christian communicator; or a trusted friend may say just the right thing seemingly out of the blue, but it’s not. I find great comfort in knowing He hears, and He answers in His timing; just when we need it the most. “Humble yourselves, therefore, under the mighty hand of God, so that He may exalt you at the proper time, casting all your care on Him, because He cares about you. May His grace and peace be with you! We live in a culture in America where education is valued highly, and most parents strongly encourage early learning and higher education. We also live in an era where information is easily accessible; at the touch of our fingertips, we can educate ourselves on almost any topic we desire. It was inconceivable just twenty-five years ago the speed at which our world would change and that we would be able to use the internet to research any topic that we desired; becoming well trained on that subject. The question is, whether we are speaking of education or in our knowledge of Scripture, are we making the most of the knowledge that we have acquired? Are we in our quest for knowledge also seeking wisdom? Wisdom is needed to apply knowledge, especially if we desire to be most effective in its application. Even so, notice the verse doesn’t stop there. We are also encouraged to get understanding. Here I would ask: Understanding of what? Consider this, sometimes when conversations flow something will be said that will stir up a disagreement or perhaps something has been said that is misunderstood, and offense is triggered. Sometimes offense is triggered because harsh attitudes or bluntness. Other times it is unknowingly triggered. Perhaps we did not convey our thoughts or hearts wisely. Then again, we could have been using wisdom in our conversation but failed to include understanding; explaining ourselves well. They may be distracted or struggling because of a personal issue or pain in their lives. Lastly, if we spoke with wisdom when conveying our thoughts, and we sought to bring understanding to the person to whom we were speaking; did we speak to them with an understanding of who they are? ; their personality type? ; and the things with which they may be dealing? Did we consider them? Did we just throw something at them or did we engage with them first? Wisdom is invaluable in life. Whether you are working with your child, your teen, your spouse, coworker or boss; wisdom is a key asset that we are wise to pray to receive. James 1:5 “But if any of you lacks wisdom, let him ask of God, who gives to all generously and without reproach, and it will be given to him.” Prayer for understanding, often neglected, is also essential. Wisdom is defined as the application of experience, knowledge, and sound judgment. That is pretty powerful in itself! Now imagine adding understanding as an element. Understanding as a noun implies comprehension, insight and if you will, the archaic meaning good judgment. What we sometimes miss in the fray is that understanding is also an adjective meaning sympathetically aware of other’s feelings; to be tolerant, forgiving. What a gift it would be if we chose to apply our experience and knowledge with sound judgment and full comprehension; all the while being sympathetically aware of the feelings of those we are interacting with from a heart of tolerance and forgiveness. Sure, it isn’t easy to set aside strong opinions and attitudes. It takes strength to push of feelings to the side for a while but what would happen if we asked gentle questions of others rather than having harsh confrontations, prompting them to truly think about the issues at hand? I believe in most situations; it would initiate constructive conversations and provide a safe place for people to work out issues that may have previously seemed beyond resolution. It would certainly go a long way in bridging gaps in communication and avoid some of the frustrations of communication between differing personality types. Have you ever found yourself right smack-dab in the middle of a dry place? That place where you feel a bit out of place or out of touch? In a spot where answers evade you to the questions pressing on your mind or heart? Have you ever felt distanced and far from all that seems normal and feels right in your life? I know I have during seasons of my life! I am willing to bet that is exactly how the Hebrew slaves felt walking in the wilderness after being freed. Likely it is also how Moses felt during and after his experience with God at the burning bush in Exodus 3. Consider for a moment, if you will: seeing that bush on fire yet not consumed; a voice from nowhere calling out for you by name; asking you to stop and remove your shoes because the ground you are standing on is holy; followed by an encounter Most High God. Can you just imagine, not only being called out by name in the desert but being commissioned to return to the town you grew up (where they know you killed a man while defending another) to exact freedom your people enslaved there? God had heard His people’s cries. After four hundred years of slavery increasing in workload and pressure, this group was suffering more than ever. God commissioned Moses for the job and allowed Aaron as his side-kick. Interestingly, after this encounter when Moses entered Egypt and approached the Pharoah, he approached with the request to be allowed a three-day retreat into the desert to worship and sacrifice to God. Notice Moses initially mentioned nothing about freeing the people or the Promised Land. If you know the story, you also realize it was a long, arduous process but in the end leads to the release their people. Time after time Moses approached Pharoah each instance Pharoah either answered no or changed his mind. Ten plagues later, Pharoah released them and sent the people away with many riches only to chase after the Hebrews and be swallowed up by the Red Sea. It only took a short time in the wilderness for the people to begin complaining and grumbling about their circumstances. God purpose was to get His people to the promised land via the desert. There was a shorter way, but it would lead them to the land of the Philistines, and they were not yet prepared to face this enemy. Here the people had two choices: trust, obey and worship the God of their fathers that had freed them from oppression; or we can grumble and complain. As we observed, they choose the latter. When faced with a dry place, desert experiences or simply times that God seems quiet in our lives we have a choice of how we respond. Will we choose to turn inward and if we do will we focus more on ourselves or seek to change and grow? Will we grumble and complain fighting against whatever God may be trying to bring forth in our life? Will we choose to press into the things of God and accept that He has a purpose or plan for the things we encounter? Will we continue in faith to trust His heart and His goodness? Will we worship Him in these times? Many times we can not control our circumstances, but we can control our response. Our response can mean the difference between a more direct route and a long winding journey. The Hebrew response resulted in a forty-year journey; ours does not have to! Our response to our circumstances can make all the difference! Who Are We Building For? What does this mean? Clearly, the people in this situation thought they were doing the work of a Christ-follower and expected to be included in those who would enter the Kingdom. Yet Jesus says to them, “I never knew you.” I don’t know about you, but this statement certainly gives me pause! It brings up many questions in my mind and makes me want to take an up close look at who I am. What does a true believer look like? We can go back and take a look at Matthew 5, 6 and 7 for some answers. Is it enough to just believe in Jesus Christ? After all, James 2:19 says that even the demons believe that there is one true God and because of that they tremble or shudder. They certainly won’t be entering the Kingdom of God. Maybe it just isn’t as simple as some today make it seem. How many times have I heard it said “believe on the Lord Jesus and you will be saved.” Are we propagating cheap grace? Fire insurance? and numbers? or are we truly interested in making disciples as Christ instructed? It is certainly worth consideration! Romans 10:8-9 tells us: “8 But what does it say? “THE WORD IS NEAR YOU, IN YOUR MOUTH AND IN YOUR HEART “– that is, the word of faith which we are preaching, 9 that if you confess with your mouth Jesus as Lord, and believe in your heart that God raised Him from the dead, you will be saved; 10 for with the heart a person believes, resulting in righteousness, and with the mouth he confesses, resulting in salvation.…” How if we have done this, do we go from salvation to depart from me, I never knew you? Have we come to a place or are we coming to a place in the western world where we teach about salvation and then drop the ball when it comes to scantification? Do professing Christians look decidedly different in their lifestyle than non-believers? I want to be careful here to explain. I am not talking about looking different by telling everyone they are going to hell because… 9you can fill in the blank0. Nor am I talking about people who go around telling everyone one what they are doing wrong and why in a judgemental and condescending way. That is not how Jesus worked! Jesus met people where they were along His way and He loved them. Did He tell the woman at the well and others about their life, yes. But He did so in a way that compelled her to go back to her people and tell them about this man who told her all about her life and invited them to know Him. That tells me He was gentle and loving because judgemental and condescending generally does not produce positive results but anger and resentment. Another possibility is that we in the western world do not understand the concept of Lord. Most have never been under an immediate autority other than our parent(s). We may have been under authority at work where we are ‘paid’ to do as we are told. AS a whole, we are very independent and most often whether right or wrong self-governed people. Submission to someone else is quite foreign to many of us. Christianity is all about submission to Christ. Paul said follow me as I follow Jesus Christ. (1 Corinthians 11:1). Christ is our ultimate example of how we are to live our lives. His life was lived according to what Father God asked of Him. The mark of a true believer/follower is to be conformed to the image of Christ. Everyday our life should look a little more like His if we are truly His followers. Heavenly Father, thank you for Your grace and mercy to Your people! Lord, thank you that wisdom is available to each of us if we ask You for it. I pray that you will give us a heart for You and to be Christ’s representative’s on this earth; loving others as He loved us and walking out the Fruit of the Spirit with each step we take. I ask that Your Bride will arise and walk differently in this world, that we will be known for our love each other and for others and that love, joy, peace, patience, kindness, gentleness, faithfulness, goodness and self-control will dominate our lives and touch the lives of all who are around us. May there be unity among the body and may revival breakout beginning with the body of Christ. In the mighty and powerful name of Jesus Christ! May grace and peace be multiplied through all who believe! Over the past few days, I have been looking back at life. You see, my husband and I have been asked to be a part of a relationship conference this next weekend. It will consist of a brief testimony from five couples about marriage and then will be followed by a “rapid fire” question and answer period. The groups will be divided into unmarried, married under ten years, married over ten years. Then all the groups will reunite for an overview and more q&a. We are blessed to have four couples with over 35 years experience participating! I spent some time this weekend looking back at the things we have been through together. I was amazed to see how quickly the challenges began in our marriage and how those struggles were clustered together; back to back, and sometimes year after year. Many were heavy duty challenges, not just the typical adjusting to life together or financial issues. Those can be difficult enough. We experienced a number of deaths of loved ones close in succession; some following long term illness and some sudden. It was a little shocking to look back. It was also pretty gratifiing at the same time seeing all that we have come through and how it changed each of us; how we grew through those times. The thing is, often it is those very struggles in life that cause us to grow, mature and strengthen. They push us to do something other than just get by. They force us to look for answers, to seek wisdom. Hopefully they lead us to seek out God; His wisdom and understanding; and godly answers. Even when that is not the case, we are able to learn what not to do the next time and what does not work. As we grow and mature through these times, it puts us in the perfect place to help others who go through similar situations. I could’t help but feel a little overwhelmed and amazed as I glanced the highlights of the years. Just the major events, both the good ones and the hard ones. Would we have ever signed up for this if we’d known what was coming? I really don’t know. I would hope so! I have to say as good as the good has been and as hard as the hard has been; I wouldn’t change a thing! There are times we each wish we had done better or differently but the truth is it has all worked together for good to get both of us were we are today. We are better for those struggles because they have changed us. They have stretched and matured us. Fears are fewer; faith is stronger. Best of all, our Heavenly Father is so very real and present in our lives. He is the true reason that we are here today! If our stories can help others coming along behind us, all the better. By His mercy and grace, we have and continue to hold fast in both our faith and in our marriage. Love deepens with both the good times and the struggles we face when our hearts are set on Him! He is the unifier and the glue that holds this relationship together on the sunny days and on the stormy seas. May God’s mercy, grace and peace surround you this day! What a powerful scripture! We have received the same promises as the Hebrew children wandering in the wilderness! This challenged me to ask this question… Just how many promises does the Bible contain? Enter Internet search engines. They are great for my inquiring mind; just remember we can’t believe all we read there. How many promises are there in the Bible? The answers I found varied widely. The first site I found concluded there were 3,573 (bible info.com). Others ranged from 3,000 all the way up to over 30,000! No two sites agreed on the number but that doesn’t really matter for our purpose today. The point is the Bible is full of all kinds of promises for our life and according the the verse above they are not just for the people of old; they are for us. I don’t know about you, but that gives me great hope and excitement. You don’t have to live long on this planet before you realize that life can be very challenging at times! Our desire is to live fairly uncomplicated lives and we want that for our children as well. Unfortunately, it doesn’t always turn out that way for us. If you have circled the sun a few times on this planet, you know this! When life decides to hurl curve balls and fast balls our way, what do we do? How do we keep the gale force winds in life from blowing us right into hopelessness, depression and despair? Sometimes we seek out council from a trusted parent, sibling, mentor, friend or other relative. It’s great to have those people in our lives! What if the situation is too overwhelming; too complicated; to big; to tender; or perhaps just too embarrassing to share? What happens when that burden is excruciatingly heavy and there seems to be no relief from it’s weight in sight? Live freely and lightly! That’s what I want every day! So how do we accomplish this is our lives? What are some practical steps? How do we rise above what the world throws our way? How do we overcome discouragement, fear and doubt? I guarentee many will think my answer is over-simplistic and that’s ok. I’ve been there too! For many it will seem not only over-simplistic but far fetched. It’s fine, your doubts will not cause any resentment from me. The answer to every question, need or dilemma we have is in the Word of God. I have put it to the test and every single time I have come away with help; comfort; peace. Our post modern culture will tell us God’s Word isn’t revelant or that it’s archaic. They may say it’s too restrictive; all about rules, etc. Even if there is just a bit of truth in what is culturally said about the Bible in our day, how can you dismiss it if you have never truly tested it for yourself? Whether the actual number of promises found within it’s covers is 3,000 or 33,000; one thing is sure. One of them will fit what you’re facing at least on some level and is worth deciding to stand on that promise in faith. When doubt comes, pray and speak the promise over and over. I doesn’t hurt to keep a check on your motives in the process; are my motives pure and is my heart in the right place? As a believer and follower of Jesus Christ, the best gift we can give ourselves is knowing who God says we are in Christ and being grounded in His Word and His promises. Why? Because the Holy Spirit will remind us or bring it to our mind in time of need or crisis. This is a process and takes time. In the mean time, when attacks or problems come what do we do? Personally, if I don’t know a promise for my situation, I grab my phone; open the browser and search… Scripture for ______? You can fill in the topic with the need. Example: scripture for doubt, fear, discouragement, rejection, etc. Who does the Bible say I am in Christ? What does the Bible say about healing? A word of warning, if you are using the Internet, not everything you find will be accurate and true so test what you find. Also, check it against God’s Word; that it is in context with the scriptures around it; test it against other scriptures; and pray for wisdom, understanding and revelation reguarding the scripture. This may seem a little complicated, but it is worth it because it works. It is possible to rest in Christ even in the middle of a storm!